"H&BR" redirects here. It is not to be confused with the Hampton and Branchville Railroad (South Carolina, USA). The Hull Barnsley & West Riding Junction Railway and Dock Company (HB&WRJR&DCo.) was opened on 20 July 1885. It had a total projected length of 66 miles but never reached Barnsley, stopping a few miles short at Stairfoot. The name was changed to The Hull and Barnsley Railway (H&BR) in 1905. Its Alexandra Dock in Hull opened 16 July 1885. The main line ran from Hull to Cudworth, with two other lines branching off at Wrangbrook Junction, the South Yorkshire Junction Railway to Denaby, and The Hull & South Yorkshire Extension Railway, an eight-mile branch to Wath-upon-Dearne, opened 31 March 1902. The company also had joint running powers on the Hull and Barnsley and Great Central Joint Railway (Gowdall and Braithwell Railway). Before the Grouping of 1923, the line was taken over by the North Eastern Railway (NER). Following incorporation into the London and North Eastern Railway (LNER), duplicated infrastructure was closed or reduced in function – notably Cannon Street station and the Springhead Locomotive Works. By the 19th century the coalfields of southern Yorkshire were producing large amounts of coal, the industrialised midland region was making manufactured goods, and the new industrial towns of the West Riding of Yorkshire and of Lancashire were producing cloth and other goods. Thus opportunities for trade, export and profit existed along the east coast of England as well as along the Humber and the tributary rivers feeding it. Goole had risen from nothing as a port on the Ouse with the creation of the Knottingley to Goole Canal in 1826 by the Aire and Calder Canal Company; the port, built to generous specifications rapidly gained inward and outward trade – much to the chagrin of Hull, and spurred the development of the extension of the Leeds and Selby Railway to Hull which opened in 1840. Additionally the North Eastern Railway – which had a monopoly on rail transport to Hull - prevented other rail companies investing there, and so Goole gained its own railway by the Wakefield, Pontefract and Goole Railway (later part of the Lancashire and Yorkshire Railway) in 1848. A custom-built railway dock and the use of specialised coal barges and unloading facilities, as well as the backing of the Aire and Calder Canal company, made it a very viable competitor to Hull for trade. Hull had expanded rapidly during the 18th century with shipping tonnages increasing over ten times in that period, and numerous docks supplementing and connecting Old Dock (Queen's Dock) being built by the Dock company in the 19th: Humber Dock 1809, Junction Dock (Prince's Dock) 1829, by 1846 Railway Dock connected to the Hull and Selby Railway (later part of the NER), as well as Victoria Dock (1850), Albert Dock (1869) and St Andrews Dock (1883). Despite all this activity, the Dock company was criticised for lack of action – specifically with regard to construction of facilities that would make Hull a foremost coal-exporting port. Additionally, the NER - whose interests in the north-east of England were in competition with Hull, and which held a monopoly on rail transport to Hull - was viewed with mistrust, suspicion, dissatisfaction and even hate, so much that schemes for independent railways or a company other than the NER were proposed that would build a line to Hull, including a bridge over, and tunnels under, the Humber were being actively promoted by Hull merchants. ..the traffic overwhelmed the powers of the Railway Company ; orders for supplies of goods could not be executed, vessels could not receive or discharge cargoes, and the general trade of the port was almost paralysed. The plans finally found fruition in 1880 in the charge of Col. Gerald Smith (a Hull banker) and through the cooperation of the Hull Corporation (including the sale of land to the railway, and an investment of £100,000). As part of the Hull Corporation's involvement with the scheme came the power to veto any joint workings with other railway companies or selling or leasing of land, and despite the opposition of the NER (which had been instrumental in blocking previous plans), the Bill of Parliament was passed with minor alterations on 26 August 1880. The company The Hull, Barnsley and West Riding Junction Railway and Dock Company (formed 1879) began work on the new line and associated deep-water dock which was completed by 1885. In full, the Hull, Barnsley and West Riding Junction Railway and Dock company. For construction of the line Parliament authorised a share issue of £3,000,0000 and loans of £1,000,000. The engineer for the main line was William Shelford, whilst Stephen Best was responsible for the Hull section, and Benjamin Baker designed the Alexandra Dock The contractors were Messrs. Lucas and Aird. The line was one of the earlier built with the aid of steam navvies. The spoil excavated by men and machines from tunnels and cuttings was used to build embankments elsewhere Around 8,000 navvies, including both Scots and Irish as well as English, were employed in the constructions, the largest concentration of which was to be found at Riplingham (near to the Drewton tunnel). The average wage was 15 shillings for a 58-hour week. The Weedley Tunnel was not originally planned; the track was to skirt the hill to the south. However unstable ground meant that the line tunnelled through the hill instead. The South Kirby tunnel passed through Magnesian Limestone to reach the lower beds of sandstone, and clay. Excavation of tunnels and cuttings included the practice of tunnelling into the rock, placing charges, then moving up the contractors wagons and detonating the charges so that the blasted rock would fall into the wagons. The majority (eighty eight) of the bridges were of plate girder construction with usually three plate sides (one central) supporting cross-beams on which the track was supported. For longer spans a girder "N" truss design was used[note 6] These larger bridges incorporate rollers on one end to allow for the thermal expansion of the bridge. For other long spans, and for the two swing bridges on the line (Ouse and Hull bridges), open girder truss of approximately parabolic shape (open truss bowstring) were used. Both swing bridges were manufactured by Messrs. Handyside of Derby. In addition to wrought iron bridges, brick arches were also used, both for crossing small dykes and country lanes, as well as the abutments to bridges and in place of embankments on short sections between bridges. At Beverley Road, Willerby & Kirk Ella, North Cave and Wallingfen were two-storey buildings with the upper storey accessing the embanked track. Stations were built in the English Queen Anne revival style – with decorative external brick courses between floors and brick lintels; minor embellishments on other brick structures such as bridge buttresses roughly echoed the same style. In July 1884 work stopped for 5 months, through a failure to raise funds through a share issue to pay the workers. Parliament allowed the additional debts to be taken for the work to continue, by completion the total share issue was £6,000,000 and the loans £3,500,000. At this point the line was almost complete but the subsequent cost cutting meant that the planned grand terminus close to the centre of Hull was never built. Much of the assets of the Hull Barnsley and West Riding Junction Railway and Dock Company (HB&WRJR&DCo) lay in Hull. [note 7] The line terminated in Hull at three main points: Alexandra Dock; for import and export of goods by sea, Cannon Street station (a goods station and also the passenger terminus), and Neptune Street goods station, the main goods terminus. The HB&WRJR&DCo's main asset was Alexandra Dock. At the time of its construction it was the largest in Britain at 46.5 acres (188,000 m2) and was expanded by 7 acres (28,000 m2) in 1889. The entrance lock was 550 ft (170 m) long at 85 ft (26 m) wide. Two graving docks, one 500 ft (150 m) long and 60 ft (18 m) wide, the other a little bigger were also built at the north-east corner of the dock. Its primary purpose was the export of coal; in the opposite direction pit props, as well as cut wood were transported. Distances on the line (mileposts) were measured from Alexandra Dock, and the up direction was from Hull to Barnsley. From here the track rose, joining the embankment, and crossed Hedon Road,[note 8] beginning its curved route round Hull by numerous bridges, crossing roads, drains, and the North Eastern Railway's own track, the first major crossing after Hedon Road being the NER's Hull to Withernsea Line. Next was a minor goods yard situated at Burleigh Street, then the Foredyke Stream (a drainage canal) and the NER's Hull to Hornsea Line were crossed close together. The line then crossed the River Hull at the Hull Bridge, and then branches (from the down direction) serving Sculcoates goods yard (southward) and the British Gas Light Company's gas works (northward). Westward from Sculcoates goods yard a spur ran backwards to serve Hull Corporation's own electricity power plant (opened 1895). After Sculcoates junction and the Beverley and Barmston drain came Beverley Road junction where the line from Cannon Street station coming from the south-east joined the westward-travelling main line. The branch to Cannon Street station first passed Beverley Road station, almost immediately after the junction. Beverley Road station was a two-storey building with the upper storey accessing the embanked track. [note 9] The line then curved south and after a 1 in 50 descent reached the level again and terminated at Cannon Street. Initially Cannon Street was intended to be a carriage shed with the main station building situated closer to the centre of town at Charlotte Street near Kingston Square where the company's offices where located. [img 1] Lack of funds, and the expense of purchasing expensive real estate in the centre of the town meant that Cannon Street became the main terminus. The station was in one of the most densely populated areas of the town, close to the river and its associated seed oil and varnish works, the buildings being quickly constructed of wood, and surrounded by the company's own coal yards, all of which would have given a poor impression compared with the facilities offered by the NER. From Beverley Road junction the main line continued west crossing Newland Avenue, and the NER's Hull to Cottingham Line before reaching a triangle of track (or Wye) where a line turned south to terminate at Neptune Street goods station. Before reaching Neptune Street, after a branch to a smaller goods station at Dairycoates to the east of the north–south track, the line curved east and crossed the NER's main line to Paragon Station at Hessle Road junction by an open girder truss bowstring bridge. From the wye of track at Springbank junctions on the route towards Barnsley the line continued west past the Springhead works. The works were built on green-field land north of the main line outside the then area of urbanisation of Hull, and expanded considerably post opening. At Springhead, south of the main line, there was a through goods loop which also gave access to a considerable area of sidings operated from 1908 onwards. From the Springhead yard Hull Corporation's Springhead Waterworks was supplied with coal to power its steam-driven pumping engine. Beyond Springhead the line continued on embanked track towards Willerby and Kirk Ella station, then crossing the small shallow valley at Eppleworth in the foothills of the Yorkshire Wolds by a brick viaduct[img 2] (locally known as "five arches"). From here the line rose to Little Weighton station via a 83 ft (25 m) deep cutting. Then the line reached a high point of 262 ft (80 m) after inclines of up to 1 in 100 before entering the 2,116-yard (1,935 m) Drewton Tunnel after which the descent grade was 1 in 150 for seven miles, passing through Sugar Loaf Tunnel and Weedley Tunnel further west, both shorter tunnels of 132 yards (121 m), and then South Cave and North Cave stations. Beyond North Cave the land is flat, and the line turned steadily south-west aiming for Barnsley, passing through Newport, Sandholme, and Eastrington, before passing over the NER's Hull to Selby Line followed by Howden and Barmby stations. The next major obstacle of the River Ouse was crossed by a swing bridge at Long Drax. The minor station of Drax preceded a crossing under the NER's Selby to Goole Line after which was Carlton station and then the first of the junctions with other railways through which the Hull and Barnsley obtained much of its traffic. Almost immediately after a bridge crossing over the River Aire, a branch heading north-south joined the line at Aire junction; this was jointly operated by the H&BR and Great Central Railway which opened in 1916 and was known as the Hull and Barnsley and Great Central Joint Line. Less than a mile south-west of Aire junction a westward junction (Gowdall junction) connected the H&BR to the Lancashire and Yorkshire Railway (L&YR) at Hensall junction via a short chord. The main line continued south-west and crossed over the same L&Y line (the Wakefield, Pontefract and Goole Railway then owned by the L&YR). About a mile further on the line crossed over the NER main line to Selby (the former East Coast Main Line via Shaftholme and Selby. The line then crossed the Knottingley and Goole Canal, then went over another L&YR line (connecting Knottingley to Shaftholme junction) before arriving in Kirk Smeaton station. After Kirk Smeaton the terrain becomes hilly again, but with Magnesian Limestone (see Dolostone) replacing the softer chalk found in the Wolds; after a cutting the line entered the 1,226-yard (1,121 m) South Kirby Tunnel (commonly known as the Barnsdale Tunnel) before reaching Wrangbrook Junction. Here the South Yorkshire Junction Railway (opened 1894) branched south and then south-east ultimately for Denaby, whilst The Hull & South Yorkshire Extension Railway (opened 1902) branched soon after travelling roughly south towards Wath, whilst the line heading for Barnsley continued roughly west-south-west. After Upton the line crossed over the Swinton and Knottingley joint line (Midland and North Eastern railways), shortly after a branch west from Hemsworth East junction connected the line to the West Riding and Grimsby joint line which was operated by the Manchester, Sheffield and Lincolnshire (after 1897 the Great Central) and Great Northern railways; which was then passed over by the continuation of the H&BR main line. The next station was Hemsworth. The final tunnel on the line was Brierley Tunnel which is 685 yards (626 m) long. The line then passed westward through Brierley junction where a southward-turning chord connected with the Dearne Valley Line on which the H&BR had running powers. A northward continuation of the Dearne Valley Line was then passed under. Finally Cudworth was reached: first was Cudworth Goods station; then Cudworth North junction, where the line split into two main branches; a third branch west joined the Midland Railway via goods exchange sidings. The westernmost of the two main branches crossed the Midland Line by girder truss bridge, then a spur to Monk Bretton station left west, whilst the final part of the line continued to Stairfoot junction where it joined the Great Central main line. The easterly branch ran to Cudworth station where there was a platform, but no connection. The line's second locomotive depot was found at Cudworth, as well as marshalling yards. The whole main line as built was double tracked. The HB&WRJR&DCo. began business with large amounts of debt, and within a year of its opening a price war had begun between the Hull Dock Company and the Hull and Barnsley on dock charges, and between the Hull and Barnsley and the NER on transit charges. Neither of the two Hull-based companies could expect to win against the much larger North Eastern Railway. By 1887 the HB&WRJR&DCo. was seeking a way out of debt and approached the Midland Railway for a possible merger. Reasonable terms were made, but the proposal was rejected by the shareholders of the Hull company. An amalgamation by the NER itself was then proposed, which would have included the NER paying off the HB&WRJR&DCo. 's debts; this scheme too was rejected. The Hull and Barnsley, unable to pay its debts, went into receivership for two years until 1889. The Hull Dock Company amalgamated with the NER in the early 1893, – requiring another act of parliament – one condition of which was that in the event of the NER building another dock in Hull (which had already been planned in 1891 as part of an unsuccessful merger attempt between the H,B&WRJ and the NER) the Hull and Barnsley should give its consent, and be able to make the new dock a joint operation between the two railway companies. Additionally an agreement was reached that there would be no reduction in dock duties without prior agreement or discussion. In 1894 the South Yorkshire Junction Railway opened. Though independent, it was worked by Hull and Barnsley engines, and connected the company to more collieries. In the following years of the 1890s various proposals, including another to merge the NER and HB&WRJR&DCo., and others for expansion of the Hull docks came, but were blocked by one party's interests or another's. Finally in 1899 both railway companies had agreed to the construction of a new dock, to the east of Alexandra Dock, access to which was from the HB&WRJ's elevated line via an extension from Alexandra Dock, and from a joint line branching off the H&BR at Bridges Junction. In 1902 an extension from Wrangbrook junction opened, connecting to Wath and further collieries. From 1905 cooperation with the Midland allowed trains to run all the way to Sheffield via Cudworth; the same year Edward Watkin, nephew of Sir Edward Watkin, became general manager of the company. For these express trains bogie coaches were purchased and M. Stirling's 4-4-0 tender locomotives used. From 1907 at Sandholme there were marshalling yards and a turntable, enabling freight trains to be split in two for the steep section towards Hull into the Wolds hills. After exiting receivership, the fortunes of the Hull and Barnsley recovered and it began to pay reasonable dividends on ordinary stock. In 1905 the Hull Barnsley and West Riding Junction Railway and Dock Company officially changed its named to the shorter Hull and Barnsley Railway. The same year running powers were obtained and a junction made with the Dearne Valley Railway. Also in that year the National Radiator company opened in Hull. The site was served by a siding from Ella Street on the H&BR line, as well as being accessed by a siding from the NER on the Hull to Bridlington line, forming a non-official line link between the networks of H&BR and NER. Construction of the new dock – "King George V Dock" – was completed by 1914. In 1916 the Hull and Barnsley and Great Central Joint Railway opened, adding to the number of collieries from which the company could transport coal. On 23 December 1903, a passenger train collided with wagons on the line at Springhead Junction, Hull. Locomotive No.34 with a train of 5 four wheel carriages and a fish van ran into the back of a formation of a brake van and 11 loaded mineral wagons which had detached unnoticed from an earlier train due to a broken coupling. The driver was seriously injured, passengers reported only minor injuries. At around midnight 25 September 1907 the boiler of F2 locomotive No. 109 exploded. The train was halted whilst the fireman was collecting a signal token before Wrangbrook Junction near Wath when the boiler exploded. The driver, John Edward Brook, was blown 400 yards by the blast and was badly scalded and injured; he was taken to Beckett Hospital in Barnsley but died 4 days later. An inquest was held, where a boiler specialist reported that 30 ⅞" stays had given way - the stays had been over repaired without replacement; it was noted that suspect stays had been reported in March, and that a boilersmith had previously warned the stays required replacement. A verdict of accidental death was returned, on the basis of an error of judgement having been made. The H&BR never manufactured any of its own locomotives, all being built elsewhere. The first types in use were of the design W. Kirtley (Locomotive Superintendent of the London, Chatham and Dover Railway) who was acting as a consultant. Matthew Stirling (son of Patrick Stirling of 'Stirling Single' fame) was the first and only Locomotive superintendent of the H&BR during its independence, and who undertook the rebuilding of some of Mr. Kirtley's designs, as well as contracting the construction of his own designs to various builders. His locomotives were typically domeless, and many of the original Kirtley engines were also rebuilt without domes. Kirtley's locomotives were painted black with grey lining. Matthew Stirling subtly modified the livery – using invisible green (black except in bright sunlight) produced from a 50:50 mixture of 'drop black' and 'brunswick green'. Lining was of broad stripes of blue (ultramarine) with red (vermilion) edges. The 2-4-0 and 0-6-0 tender locomotives procured by Kitley carried a small cursive monogram of the letters "HB&WRJR", other locomotives carried the initials "H&BR". A total of 186 engines were operated by the Hull and Barnsley Railway, on merging into the NER the locomotives were briefly renumbered by adding 3000 to the original number. Following the incorporation into the LNER soon after the surviving locomotives were assigned numbers between 2405 and 2542, in no specific order. Most except the H&BR Class F3 (LNER Class N13) were withdrawn between 1930 and 1940, the B Class beginning withdrawal earlier in 1925. The last F3 was withdrawn in 1956. Initially the railway used 30 ft (9.1 m) 2-axle coaches, by the time services to Sheffield were introduced the company had 4-axle 51 ft (16 m) composite corridor coaches on bogies. Most of the rolling stock was for freight; in 1923 the company had 4,808 freight wagons of which over 3,000 were open wagons. Additionally the company possessed a snow plough, since the cuttings in the Yorkshire Wolds were prone to drifts when snow occurred. Alexandra – tug built by Earle's shipbuilding of Hull in 1885. Barnsley – tug – a sister of "Alexandra" built in 1886 but not by the same builder. Hull – tug built by J.P. Rennoldson of South Shields in 1898. "H.& B.R. No. 1", "H.& B.R. No. 2" and "H.& B.R. No. 3" – static dumb dredgers. "H.& B.R. No. 4" – built by Jonkeers of Kinderdijk in 1914 ; grab dredger engined by Earle's of Hull. Transferred to N.E.R in 1922 and renamed "N.E.R Grab No. 4" and to the L.N.E.R. in 1923. Renamed "H. & B.R. Dredger No. 4" in 1938 and ownership changed again in 1948 to the Docks and Inland Waterways Executive and then to B.T. Docks Board. Eventually sold to Italian interests and broken up in 1963. 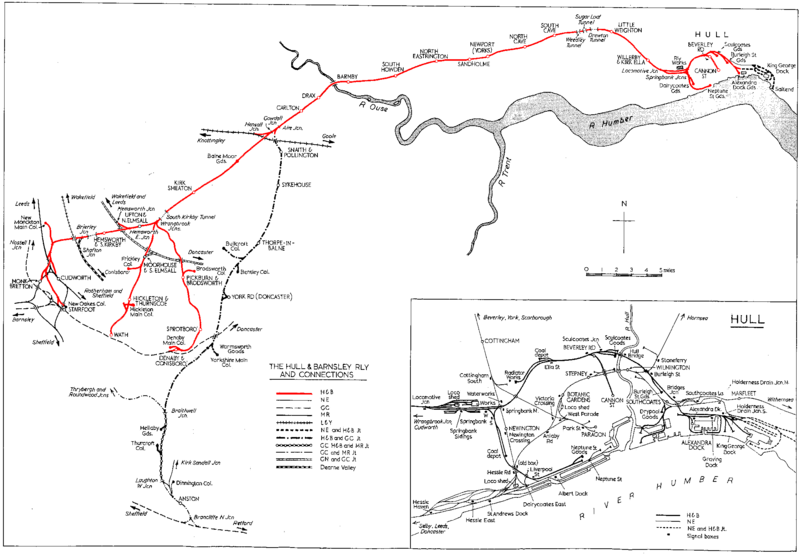 Incorporation into the NER was just part of a larger scale of consolidation throughout the British railway system, and on 1 January 1923 the NER along with the Hull and Barnsley Line became part of the London and North Eastern Railway (LNER). Mainline freight work commonly used the ex Great Central Robinson 2-8-0 locomotives (later classified as LNER Class O4). The NER Class P1 0-6-0, NER Class Y 4-6-2T, NER Class T and NER Class T2 0-8-0 locomotives inherited from the NER also replaced Hull and Barnsley types on other freight work. In 1929 a halt west of Springhead works and sidings was constructed,[note 13] The station was unstaffed, and possibly the smallest in Britain, with two wooden platforms one coach in length each (25 ft). The same month the Springhead Halt opened passenger services between Wath and Kirk Smeaton ended. Passenger services between South Howden and Cudworth ceased in 1932. The locomotive shed at Cudworth closed in 1951. Passenger services between Hull and South Howden ended in 1955. Through freight on the same line ended in 1958, with complete closure between Little Weighton and Wrangbrook junction in 1959. Freight working on remaining sections west of Hull (Springhead) closed completely in the next decade; the section between Moorhouse and Wrangbrook: 1963, between Little Weighton and Springhead : 1964, between Wrangbrook and both Monckton as well as Sproatbrough in 1967, Cudworth to Monckton in 1968. All traffic from Cudworth to Wrangbrook junction ended in 1967. The branch to Cannon Street closed completely in 1968. By 1970 the only parts of the line still with traffic were the Hull elevated section, and a few short sections with industrial uses. Alexandra Dock closed in the 1980s and the rail connection was removed, subsequently the dock re-opened but without a rail connection. Part of the elevated line to King George Dock was converted to a single line in 1988 and one train working introduced, four years later increased amounts of imports; specifically coal; meant that staffed (tokenised) working was reintroduced in 1992. Part of the path of the line between Hensall and Drax was opened for Merry Go Round trains to Drax Power Station in 1972, the Long Drax swing bridge on the Ouse to the north-east offered a link for future developments and was maintained until 1968, but was dismantled in 1976. In 2007 over £10 million was allocated to a project to increase capacity on the former Hull and Barnsley Railway branch to the Hull docks. Network Rail, Associated British Ports, Yorkshire Forward, Hull City Council and The Northern Way were involved in funding or supporting the scheme. [note 15] The work was to include partial re-doubling of the line, remedial and replacement work on the numerous bridges, and signalling upgrades, and to increase the line speed to 30 mph (48 km/h) except at Hull Bridge. The capacity of the line was to be increased from 10 to 22 trains in each direction. In late 2007 the Network Rail gave the contract to GrantRail (now VolkerRail). Work carried out included the re-instatement of a double track junction at Hessle Road (the junction with the main line, previously singled in 1984), restoration of double track from New Bridge Road to King George Dock, and removal of Ella Street bridge along with strengthening of 15 others. The upgraded line was formally opened in June 2008 by the transport minister Rosie Winterton. Work continued on the line after the official opening; the upgraded signalling system began use in September 2008. Work on the ABP owned portion of the track was carried out by Trackwork Ltd. of Doncaster,[citation needed] at a cost of over £2.5 million. In 2013 two bridges were replaced on the docks branch: a minor bridge, over James Reckitt Avenue, replaced at a cost of about £1 million, and a major bridge replacement, over Spring Bank West, costing £3.2 million. In July 2014 an attempt to solve a pigeon roosting problem under the Chanterlands Avenue railway bridge led to "hundreds of inch long maggots" from the carcasses of dead birds falling off the bridge onto a footpath, described by one passer-by as "like something out of a horror film". The cutting at Little Weighton, and nearby chalk quarries were used after closure (from 1969) as a landfill facility; filling of the quarries and cutting was approaching completion by 2008. After 2008 a site on the cutting near Willerby has been used as a recycling facility. In rural areas the embankments and earthworks remain as boundaries between fields, the trackbed west of Weedley Tunnel forms part of the Yorkshire Wolds Way and High Hunsley Circuit walks, and a section of the embankment between Kirk Ella and Hull also carries a footpath whilst a section further west is covered by the B1232 road. A section over 2 miles long north of Newport is now part of the eastern end of M62 motorway. A number of the stations have been converted into private residences. The areas of disused land west and east of Calvert Lane in Hull (formerly Springhead works and sidings and the land between Springbank East, West and South junctions) have become a wildlife habitat, the area between the junctions being assessed as "ecologically outstanding". and are classed as Sites of nature conservance importance and is a candidate site for "Local Nature Reserve status". The disused railway bridge giving walkers access to the western site was removed in August 2009. The former sidings at Calvert Lane were developed into a small housing estate "The Sidings" in the 2010s. The Hull & Barnsley Railway Stock Fund owns and restores the few surviving vehicles which once belonged to the H&BR. Two coaches, two wagons and a tool van are kept on the North Yorkshire Moors Railway. No locomotives have survived. ^ HJS "Hessle Road Junction to Saltend"
^ The devices are: (left) City of Kingston upon Hull crest, (right) Barnsley crest, (bottom) Dolphins representing the Hull docks, (above) A winged wheel. also embellisments include white roses representing Yorkshire. ^ Nephew of Sir Edward Watkin (1819–1901), railway entrepreneur and politician. ^ C.T. Goode in Railways of Hull quotes a figure of 35 within the town boundary (undated), whilst G.D. Parkes (The Hull and Barnsley Railway) notes nine substantial underline bridges ... in the first four miles. A survey using Ordnance Survey maps of the period shows that there were more than 20 within the urbanised area. Later developments in Hull led to the construction or alteration of further bridges. ^ The term 'junction' in the company's name means that it was a line that connected at a railway junction, rather than reaching a destination such as a major city; this junction (or junctions) lay at the Barnsley end of the line, meaning that there was relatively little infrastructure at that end. ^ The far side platforms at Beverley Road were accessed by a brick-lined (and tiled?) passenger tunnel (subway) under the embankment, still in existence in 2010 but closed. ^ The closure was discussed in Parliament – with respect to the loss of skilled jobs in the Hull area. ^ Newport renamed as Wallingfen, Eastrington renamed as North Eastrington, Howden renamed as South Howden, Drax renamed as Drax Abbey, and Carlton became Carlton Towers. ^ The station was added as part of the 'Hull and district interval service' – a regular service started in April 1929 in the Hull and surrounding area intended to halt a decline in passenger numbers. ^ In 2002 Hull City moved to a new stadium rendering the halt obsolete, the old stadium "Boothferry Park" was demolished between 2008 and 2010. ^ The funding for the project (as of 2008/9) was : Yorkshire Forward: £4.75 million, Northern Way: £4.75 million, Associated British Ports: £2.6 million, Network Rail, £5.1 million. ^ As many as 730 were scrapped by Drapers, one a Black 5 was later preserved. ^ Deaves, Phil. "Engineer's Line References (ELRs) : Codes beginning H". www.railwaycodes.org.uk/elrs/elrh.shtm. HJS. Retrieved 15 April 2014. ^ Gillett & MacMahon 1980, p. 271, Chapter 21 "Railways". ^ Ellis & Crowther 1990, pp. 321–325, Chapter 23 "The rise and decline of Goole as a Humber port", (J.D. Porteus). ^ Ellis & Crowther 1990, pp. 236–240, Chapter 17 "The historical development of Grimsby and Cleethorpes", (R.W. Ambler). ^ a b c d Gillett & MacMahon 1980, pp. 348–355, Chapter 25 "Pre-War"
^ Goode 1992, p. 23. ^ a b Allison, K.J., ed. (1969). "22. Communications : Railways". A History of the County of York East Riding: Volume 1: The City of Kingston upon Hull. Institute of Historical Research. pp. 387–397. ^ a b Popplewell, Lawrence, ed. (1985). A Gazetteer of the Railway Contractors and Engineers of Northern England 1830–1914. Melledgen Press. ^ Cole 1886, Plate III. ^ Parkes 1970, pp. 12–13, "Docks and Piers"
^ Chapman 1999, pp. 12–13. ^ Thompson, Michael (1992). The Railways of Hull and East Yorkshire. Hutton Press. p. 20. ^ a b Goode 1992, pp. 28, 48–50, "Cannon Street"
^ a b c d e f g h Parkes 1970, pp. 6–12, "Description of the line"
^ Suggitt 2005, pp. 141–142. ^ Goode 1992, p. 33, "Dairycoates yards and the 'straight line'". ^ Goode 1992, pp. 50–52, "The Neptune Street Branch". ^ a b Goode 1992, pp. 36–37, "The Engine sheds"
^ Parkes 1970, p. 12. ^ Goode 1992, p. 50. ^ Dodsworth 1990, p. 55. ^ a b c d e f g h i j k Allen 1974, Chapter XII "Hull and the Stranger within the Gates"
^ Parkes 1970, p. 8. ^ Parkes 1970, pp. 4–5. ^ Parkes 1970, p. 5. ^ Chapman 1999, p. 5. ^ "Company Overview". Ideal Boilers. Archived from the original on 23 March 2010. Retrieved 4 March 2013. ^ Dodsworth 1990, p. 31. ^ Broadwell, John. "H&BR engine sheds". LNER encyclopeida. LNER society. Retrieved 21 December 2018. ^ Hoole, Ken (1983). Trains in Trouble: Vol. 4. Truro: Atlantic Books. p. 19. ISBN 0-906899-07-9. ^ Barker 1996, p. 27. ^ Barker 1996, p. 83-4. ^ Dodsworth 1990, pp. 10–11. ^ Prattley 1997, inside back cover. ^ Parkes 1970, p. 23. ^ Haws, Duncan (1993). Merchant Fleets – Britain's Railway Steamers – Eastern & North Western + Zeeland and Stena. Hereford: TCL Publications. pp. 137–138. ISBN 0-946378-22-3. ^ Goode 1992, p. 48. ^ "Springhead locomotive works Hull". Parliamentary Debates (Hansard). House of Commons. 24 June 1924. col. 231–233. ^ Suggitt 2005, p. 143. ^ a b c d Chapman 1999, pp. 7–10, also 46, 51, "The H&B departs"
^ Bairstow 1995, pp. 21–27, Section "The 1929 Hull and District Interval Service" (David R. Smith). ^ Suggitt 2005, p. 143, (illustration). ^ Bairstow 1995, p. 22. ^ Bairstow 1995, p. 82. ^ Dodsworth 1990, p. 21. ^ Chapman 1999, p. 12. ^ Bairstow 1990, p. 60. ^ Bairstow 1995, p. 39. ^ "Yorkshire Forward Annual Report and Accounts 2008/09" (PDF). Yorkshire Forward. Transport, p.28. Archived from the original (PDF) on 14 January 2010. ^ "North East round-up". Railway Strategies. Schofield Publishing Ltd. 3 July 2007. Around and about Hull. ^ Bisatt, Philip (October 2007). "Rails to Hull Docks" (PDF). Railwatch: p. 15. Archived from the original (PDF) on 17 July 2011. Retrieved 21 January 2011. ^ "Rail Freight Briefing". www.lga.gov.uk. Freight on Rail. February 2010. Archived from the original on 17 July 2011. ^ "Network Rail sets out plans for Humber ports route upgrades" (PDF). Railway Herald (76): 3. 16 March 2007. ^ "GrantRail wins Hull Docks contract". www.jobs-in-rail.co.uk, source: Modern Railways. 30 November 2007. Retrieved 6 March 2013. ^ "More trains to take freight to Hull docks". This is Hull and East Riding. 11 June 2008. Archived from the original on 5 May 2013. Retrieved 17 March 2013. ^ a b "Minister Sees Rail Freight Funding in Action in Hull". Network Rail. 10 June 2008. Archived from the original on 5 May 2013. Retrieved 6 March 2013. ^ "Hull Christmas road closure sparks complaints from traders". BBC News. 19 November 2013. Retrieved 23 January 2014. ^ Young, Angus (31 December 2013). "Spring Bank West in Hull to re-open today: Businesses hoping for strong 2014 after Network Rail repairs". Hull Daily Mail. Archived from the original on 3 February 2014. Retrieved 23 January 2014. ^ Bickerdike, Graeme (February 2014). "Tales of the Unexpected". The Rail Engineer. pp. 24–28. Archived from the original on 25 February 2014. ^ "People forced to dodge hundreds of maggots falling from Hull railway bridge". Hull Daily Mail. 14 July 2014. Archived from the original on 17 July 2014. Retrieved 15 July 2014. ^ Dodsworth 1990, p. 105. ^ "It's Coming Home?". Drapers. 2 June 2008. Archived from the original on 3 September 2011. ^ "The story of Little Weighton Cutting and Drewton Tunnel: Over The Top". www.forgottenrelics.co.uk. Retrieved 3 March 2013. ^ "In-Vessel Composting facility gets 'green' light". www.biowise.co.uk. 1 June 2009. Retrieved 3 March 2013. ^ "Company History". www.wastewise.co.uk. Retrieved 3 March 2013. ^ Welbourn 1997, pp. 22–24. ^ Suggitt 2005, pp. 145–146. ^ "Hull Biodiversity Action Plan" (PDF). Hull City Council. Retrieved 3 March 2013. ^ "Kingston-Upon-Hull Open Space Assessment: Sites of Nature Conservation Importance (SNCI)" (PDF). Hull City Council. October 2008. ^ "Kingston-Upon-Hull Open Space Assessment : Sites of Nature Conservation Importance (SNCI)" (PDF). October 2008. Appendix IV Completed Site Quality Assessment Forms and Site Species Lists: NE42: Dismantled Railway Sidings East of Calvert Lane, pp.27–30; NE43: Dismantled Railway Junction West of Calvert Lane, pp.31–35. ^ "Call to create city's first nature reserves". This is Hull and East Riding. 5 January 2009. Archived from the original on 26 April 2012. Retrieved 15 January 2013. ^ "West Hull railway bridge removed". This is Hull and East Riding. 16 August 2009. Archived from the original on 17 September 2012. Retrieved 15 January 2013. ^ "(Ref. 12/01108/RES) Erection 120 dwellings, associated infrastructure and enhancement of open land (application for approval of reserved matters including appearance, landscaping, layout and scale following approval of outline application ref. 24176B)". Hull City Council. 30 November 2012. Archived from the original on 30 October 2013. Retrieved 28 October 2013. ^ "The Sidings, Hull". Barratt Homes. Retrieved 28 October 2013. Suggitt, Gordon (2005), "Chapter 13, "The Hull & Barnsley Railway"", Lost Railways of North & East Yorkshire, Countryside Books, pp. 140–147 , brief history and images. "The Hull & Barnsley Railway". The London & North Eastern Railway (LNER) Encyclopedia, www.lner.info. Retrieved 3 March 2013. ^ "The Hull and Barnsley Railway Company's Offices, Charlotte Street". Hull Museums Collection. Hull City Council. Archived from the original on 24 September 2015. Retrieved 3 March 2013. ^ "Eppleworth viaduct with train passing". Hull museums collection. Hull City Council. Retrieved 3 March 2013. Wikimedia Commons has media related to Hull and Barnsley Railway. "Images Of The Hull & Barnsley Railway". www.leytransport.i12.com. Archived from the original on 11 April 2007. "Track map of the Hull and Barnsley Railway". d240vprofozpi.cloudfront.net (source unknown). Retrieved 3 March 2013. Buckingham, Phillip. "The Hull & Barnsley Railway". www.jekyll.info. Archived from the original on 9 January 2016. Retrieved 3 March 2013.